It is with a heavy heart and sound conscience that I issue this statement on the behalf of the Assembly of the Global Defenders and and of the government of this nation. It was today, 13 April 2014, that the Soda Pop Army, our adversary in war, has claimed false victory over our armed forces on the server of Rainbow, upon the grounds that our nation illicitly utilized forbidden outside assistance in securing our victory. This, I absolutely assure you, is false. The proof presented by the Soda Pop Army is weak at best. Their evidence consists entirely upon out of context screenshots, which, quite frankly, are no proof at all. If anything, they are evidence to the contrary, as if they did indeed have ample evidence to prove their position, they would not need to rely upon screenshots whose messages have been distorted and skewed so that they seem to mean something which they never meant at all. It is thus beyond reasonable doubt that the claim of victory made by the Soda Pop Army are false and clearly exhibit their lack of sportsmanship, honour, and integrity. My message to the leaders of the Soda Pop Army is thus: You have besmirched your name as a good and honest upstart and have established a reputation of dishonour and dishonesty. You have proven that you deserve no respect or recognition and I believe that you know, deep down, that your “victory” today is naught more than a denial of your own defeat. Denial, after all, is the first stage of grief. I would also like to let it be known that this statement of censure is not directed at the troops of the Soda Pop Army. We believe, in our heart of hearts, that the soldiers of the SPA are good people who are loyal to their army. We have nothing but respect for the troops of SPA. However, we also have naught but disrespect for the leaders of the Soda Pop Army and it is thus that we censure them. Upon the request of myself, the Prime Minister, the Assembly of the Global Defenders has voted unanimously to sanction and official statement of censure against the Soda Pop Army’s leadership. 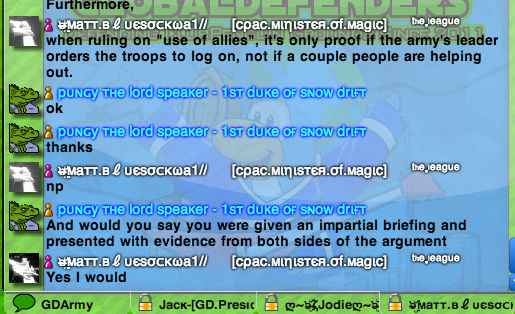 We do hereby denounce and defame the SPA leaders Tony and Jayden for their dishonour and disrespect for CP warfare. They have demonstrated a child-like lack of sportsmanship, integrity, and self-respect. These sentiments are hereby reciprocated by the Assembly of the Global Defenders. We henceforth refuse to recognize the leadership of Tony and Jayden and will sever all diplomatic ties with the two leaders. They are henceforth enemies of the state and are forever banned from entering the Global Defenders lands and chatroom. Furthermore, the case of the legitimacy of SPA’s claims have victory have been reviewed by venerable community member, Bluesockwa1, CEO of CP Army Central and an impartial reviewer of the situation. He has determined, after due review of both sides of the issue, that there is insufficient evidence to support SPA’s claims that the Global Defenders made use of allies during the event. He also has determined that, even if GD had used allies, it was never explicitly stated that they were forbidden to do so. 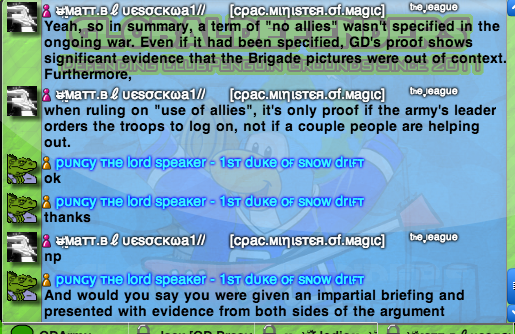 It is now irrefutably and undeniably clear that SPA’s claims to victory over GD in the battle of Rainbow per GD’s suspected use of allies which is grounded in insufficient evidence are unjust and false. Unless further convincing evidence can be found to support these claims, it must be officially recognized that the Global Defenders were victorious in the battle of Rainbow, and thus have all rights to the server hitherto. In the event that it seemed I was not making a sweeping denial of using allies during the battle, here it is: I swear, upon all that is holy and good, upon my honour and that of this army, that the Global Defenders did not make use of allied forces during the battle. We do admit that outside soldiers did indeed attend the event, however, they came of their own fruition and were from various armies from the community. They were not ordered by the leaders of their respective armies to attend this event nor were they compelled by officers of this army to attend the event. They came of their own desire and free will and there is naught that can be done to stop that nor are these actions illicit in any way. Furthermore, it is SPA who blatantly asked for allied assistance in this war. They have, it is clear, asked for help from SWAT in their war effort against the Global Defenders. Proof of this claim can be seen below. This evidence proves clearly and irrefutably that the leaders of the Soda Pop Army are naught but childish hypocrites who will violate all morality to achieve their ends. I strongly urge Tony and Jayden to cease and desist in their hypocritical ways and practice that which they preach. Tony and Jayden: You have destroyed any respect one may have had for your army whatsoever. Your are a disgrace to the CP army community and deserve to be treated as such. Graceful, very graceful Mr. Prime Minister.